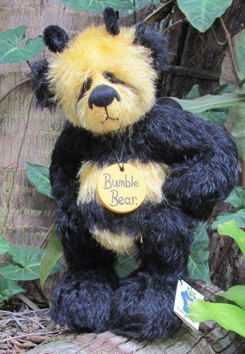 With the Great Barrier Reef just a hop and a skip away, Katrina Ndrejica of Bumble Bears makes her home in beautiful Queensland, Australia. 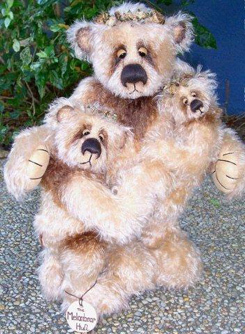 She first started making bears back in 1990 when she was looking to make a theme bedroom for her daughter. "I came across a gorgeous room in the back of a shop with old book shelves that were lined with teddy bears." Katrina envisioned a similar room for her daughter but believed that it would turn into quite an expensive task. at making teddy bears herself. So without lessons and armed with only a pattern and some fur, she set out to make her first bear. "My husband thought it was funny and said that it looked like a mouse! I wasn't going to let this deter me and I made another and things just took off from there." 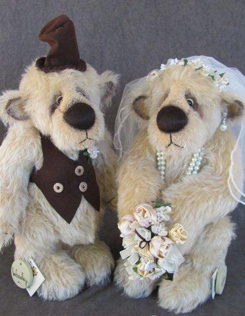 She can honestly say that her husband isn't laughing at her bears now! 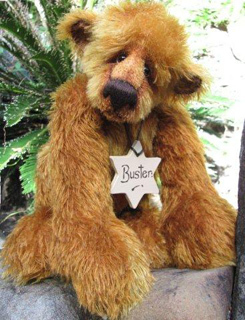 Katrina is a full-time bear maker for many years now with the occasional break to work retail. "I have a passion for fashion," she confessed. Bear making keeps her busy as she designs all of her bears entirely herself and hand-stitches everything. "I believe, as collectibles, that they have to be hand-made and limited." Her family does help her on occasion when it comes to naming the bears if she herself gets stuck and can't think of any. 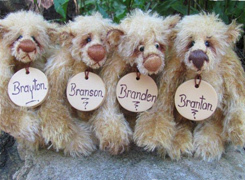 "All of my bears come with hand-painted, terra cotta name tags detailing the date they were made, if they are one of a kind or limited edition number and each has my signature on the back." 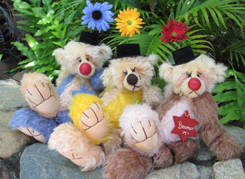 Katrina keeps her bears on the move by selling at the occasional show in Australia, through her online web site and through sites such as Bearpile. 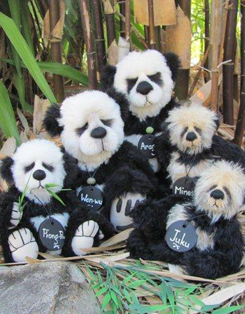 Her bears have found homes in International places like Italy, New Zealand, Signapore, the Netherlands, Estonia and Germany, to name a few. 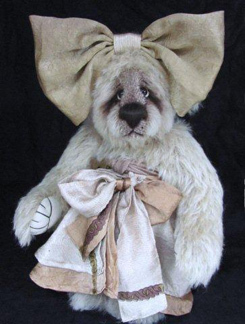 She also sells a hand-full of patterns and has been published in several teddy bear magazines. "I have a few exclusive collections that are quite recognizable as being made by me." 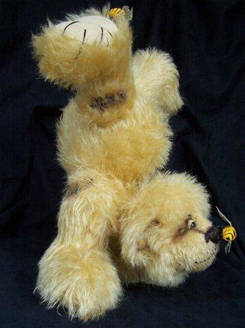 They include her "Bearonette Collection" which are moving bears similar to marionettes with 13 wobble joints. 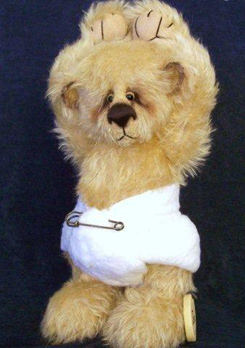 These bears are made to either hang from the ceiling with strings or are very posable without the strings as well. There is also her "Hand-Stand Collection" of acrobatic bears that stand on their front paws. 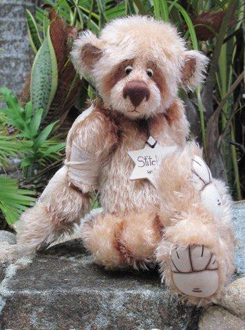 Another recognizable bear are her animated and musical "hugs." 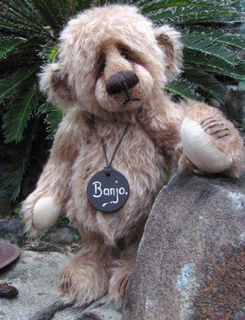 "They are several bears stitched together with the largest having a key-winding music box in the "momma bears" back. As the music box plays, her head gently rotates as though she is singing to her cubs." As a collector of bears herself, Katrina likes to make a large variety of styles so she doesn't get bored. "I hope that my bears appeal to many." Katrina is completely self-taught in her techniques so they are all unique to her. "I love their big bellies and big feet!" "I have also been fortunate enough to win awards in all competitions that I entered." 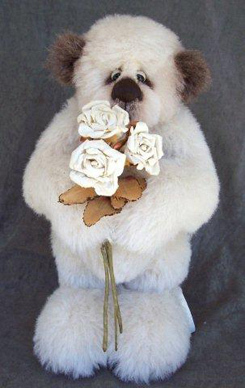 Collectors find her bears appealing because they are weighty and full-of-character. With wins in categories like "People's Choice, Best of Show, Workmanship Excellence and Most Innovative Design," the collectors have spoken.